We often hear our customers ask about the difference between sheetrock and drywall. There seems to be quite a lot of confusion coming from these two terms as people tend to get them mixed up. Essentially, they're both the same product, but sheetrock is a generic brand; think of it being Ford or Bentley while drywall is the car. Still confused? Here's what we mean. One of the most common materials used in the construction of homes and structural surfaces, drywall is basically gypsum (a powdered type of rock) which has been placed in between a couple of thick pieces of paper. It's present in most American homes as it's relatively inexpensive and easy to install, replace and repair. This means that even though it's much more prone to dings and dents when compared to other alternatives, you won't have to part with a lot of money to have it repaired. Unlike plaster, these walls can get quite heavy and inflexible which leaves them more susceptible to damage and makes them harder to curve around corners and unconventional architectural designs. Moreover, this material is a lot more stable than plaster, but tends to be less durable because of its thinness. Finally, we often hear people claiming drywall has poor moisture resistance; this is, however, not necessarily true. While it's porous in nature, there are ways to make the material completely moisture-resistant. 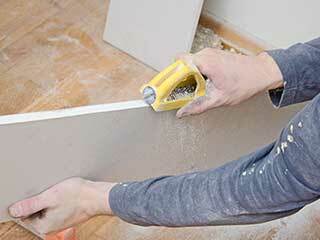 Our professionals at Drywall Repair & Remodeling, Glendale are here for your specific needs and customized solutions. We specialize in a variety of high-quality repairs and installations which our customers are 100% satisfied with. As we mentioned before, sheetrock is essentially a generic brand of drywall. They offer a wide range of different pieces which come in different thicknesses and features, including fire-resistant walls and moisture-preventing panels. In other words, sheetrock provides customers with specialized panels which suit their individual needs. Not only that, but the brand also offers professional tools which both contractors and homeowners can benefit from.